Every now an then, some manufacturer appears with some new radical concept of next generation laptop with an additional screen. Intel corp is definitely rising the bar, with their newly presented concept of next generation laptops with no less then four screens. The new line of Macbook Pro is now released. And it only proves that the leaked photos of Macbook is true. The rumored Ma cbook Touch Screen was not included in the release. Anyway it might be released soon. Who knows ? the specs. Apple’s using NVIDIA’s new 9400M GPU + chipset 1-2 punch for integrated graphics, supplemented by 9600M GT switchable discreet graphics chip for heavy lifting, and pumping out those graphics over a Mini DisplayPort connector, if you’d like to supplement the LED backlit screen. As expected there’s an SSD option, with drive accessible underneath the battery. The 15.4-inch base model retails for $1999, with a 2.4GHz Core 2 Duo processor, 2GB of DDR3 RAM and both GPUs. Step up to $2499 and you get a faster CPU, 4GB of RAM and a 320GB HDD. 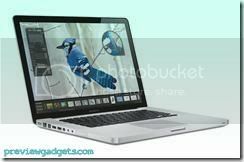 The 17-inch MacBook Pro comes in a similar configuration with a 2.6GHz processor, starting at $2799, but sans the redesign and GPU love. Hit the jump for a breakdown of the configurations. Asus EeePc is cheaper then with Windows then with Linux??? Is that another Microsoft blackmail to their partners, but this just too obvious. Or is just Asus a great fan of the Bill G, and Microsoft. New Asus’s EeePC is cheaper with Windows operating system compared with the EEEPC with Linux. We are all witness of rising popularity of 13 inch notebooks. So Toshiba’s step in that niche was expected. They had announced new 13.3 inch notebook in Toshiba’s Portege laptop series. Eco friendly computers are the next wave in computing, reducing using lead as a material in computer components producing, reducing of power consumed are the firsts step in that direction. The fastest notebook ever for gamers – Is it ? Company Vology announced the fastest laptop for gamers in the planet. This is Limited Edition Predator X-2, and company promote it as the best solution for gamers. This machine running by Intel Core 2 Quad processor on 2.66 GHz. Graphic card is nVidia GeForce 8800M GTX 512 MB GPU and it has 4GB DDR2 RAM memory.